The whio (or Blue Duck) is a seriously cool bird. It lives in white water. It is a torrent duck, and how cool is that? If kayaking is a cool whitewater sport but it is just a sport, then the whio who make white water their home, well… they must be ice cool. It is a truly beautiful bird. Its grey feathers with flecks of brown is subtle, textured and stunning. There is something Yves Saint Laurent about its palette – these colours aren’t usually seen together but combine beautifully. It evokes both the rocks and wildness of a mountain river and serenity of nature. I keep thinking “Man Alone” when I see whio. But that is only correct when you learn that the whio is the only bird in its genus and that it lives in the rugged isolated headwaters of rivers. But it doesn’t live alone. The whio couple generally stays together for their whole lives. In almost all other species of duck the male leaves the female to raise the ducklings, but not the whio, he helps guard the ducklings… and there are some nasty predators in New Zealand. I feel that the whio’s life is about struggle. It’s no doubt they always lived in rivers but perhaps not at the most wild part. The whio is truly unique. This is what I love about them. Ducks aren’t generally thought of as unique. But the whio is. It unrelated to any duck elsewhere in the world (it is the only member of its genus – I’ve already said that) and unlike any other duck, their upper bill has a thick semicircular, fleshy lip that overlaps the lower bill and allows them to scrape off insect larvae from river rocks. 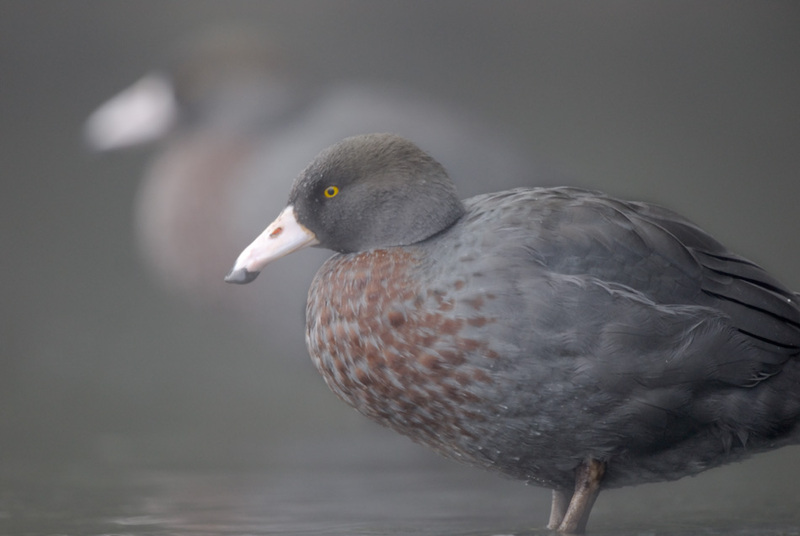 Most ducks have an iridescent patch in the centre of each wing, and the whio doesn’t. They aren’t good flyers, not that many of New Zealand’s endemic birds are. You don’t need to fly if you live in a land without stoats. All these attributes suggest that the whio is an ancient inhabitant of New Zealand. The whio / blue duck is a river super user. They have a streamlined head and large webbed feet to enable them to feed in fast moving water. They are indicators of the health of a river system. The higher the number of breeding pairs of whio on a given stretch of river, the greater the life supporting capacity of that river. It is estimated that about 640 pairs remain in North Island and under 700 pairs remain in South Island. Hopefully we will see more of our truly unique Wild Water Duck. The Department of Conservation species threat classification of blue duck/whio is “Nationally Vulnerable” and IUCN classifies them as “Endangered” because of a small and fragmented population which is undergoing a decline owing to a variety of factors, most notably the affects of introduced predators.